Apply SimpleMat to your counter, then tile - it's that easy. For efficiency lay SimpleMat horizontally on counter. Overlap SimpleMat edges 1/8" to 1/4" (3-6mm). 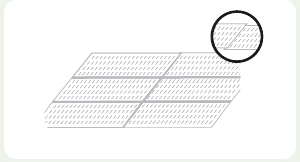 Overlapping is shaded in gray in illustration. Flatten air bubbles and creases. Cover all surfaces to be tiled. Cut corner from end of the mat to facilitate folding of corner. BULL NOSE TILE: Regular shaped tile with a rounded edge used for counter edge and other transitions. First apply tile to front of counter. 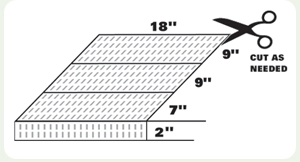 Ensure that counter tile overlaps and use spacers for a uniform grout joint. 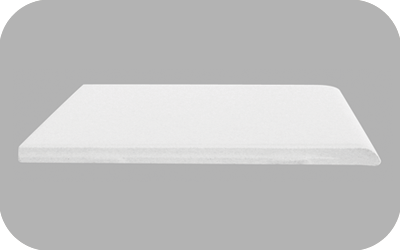 V-CAP TILE: L-shaped tile specifically used to cover the front edge of a countertop. 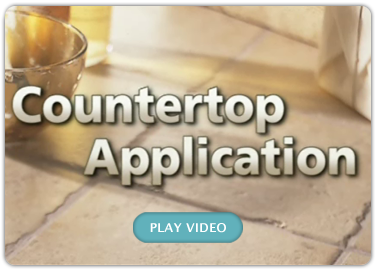 Because v-cap may not fit squarely on countertop, use SimpleGrout Pre-Mixed Grout or SimpleFix Ceramic Tile & Fixture Caulk to fill voids between v-cap and countertop. Do not apply excessive filler material as it will interfere with bond. Begin layout by positioning the front edge tiles bull nose of v-cap along front of the countertop. 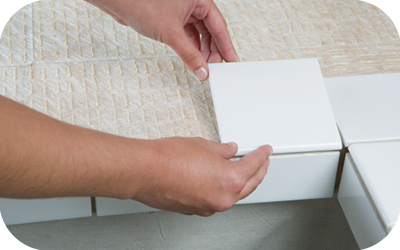 Do a dry run by placing as many full tiles on the countertop with spacers as necessary. If countertop abuts a wall, lay cut tiles against walls. For L-shaped countertops, lay full tiles at inside corner. Set bull nose or v-cap pieces in place to ensure correct amount of overhanging pieces.